Sink into a soothing spa after a day up the mountain or hiking the tracks in your private spa pool. Prepare dinner on the barbeque and enjoy a meal on your deck under your outdoor gas heater. Watch a movie or enjoy some sports on SKY TV then relax in the sauna before retiring to the comfort of your new super-comfortable bed to rest up and do it all again tomorrow! 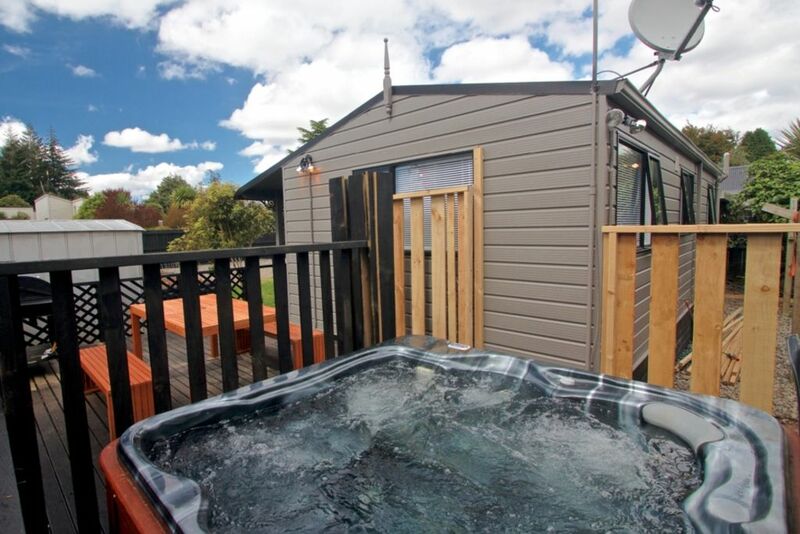 We have a massive site right in the heart of Ohakune with views of Mt Ruapehu where we have recently renovated two, 2-bedroom cottages and a funky "couples retreat" studio. Each property is fully fenced and apart from the driveway entrance, are completely independent of each other, each cottage has been beautifully renovated, one is very spacious, sleeping up to eight, the second a more compact version, also 2 bedroom cottage with a double bed in each bedroom, suitable for up to four guests, AND there is also the studio, the perfect couple's retreat. Each of these three properties is fully fenced, self-contained and HAVE THEIR OWN PRIVATE SPA POOL AND SAUNA, as well as free WIFI and SKY TV, and an all important heatpump! TV with SKY, (sports and Movies in each lounge and the studio) for enjoying the BIG Games or snuggling down in the warmth with a good movie :) and there's also a 32" TV in each bedroom! Each property has 1 shower and 1 toilet, and gas hot water so you never run out! And all with new carpet throughout. In the bigger two bedroom cottage, the lounge has a fold down double bed and massive comfortable couches for individual beds or a comfy double and makes this cottage suitable for up to 8 guests staying. There is a 3-4 person electric dry sauna with each property, a 4 person spa pool and a BBQ and outdoor heaters, make for great outdoor entertainment areas, winter or summer. All three properties are equipped with a top load washing machine, dryer, drying area/room for ski clothes etc and offers endless gas hot water. The property is exactly how it is advertised, private and quiet, the views of the mountain were stunning, even from the spa pool. The house was presented very tidy and clean, caters for all style of peoples wants. We loved the place! Easy instructions to access. Great 'little' property with all the extras, good price, but emphasis on small, OK for two solos but it would be a squeeze for two couples... close to the highway so expect a few trucks to rumble by in the night. This is a cute and affordable place with a great spa pool. This is a cute and affordable place with a great spa pool. It is quite small for a 2 bedroom, and is ideal for 2 people but would be quite cramped with 4.